My Crossroads: :WW - Lonely Fallen Coco! :WW - Lonely Fallen Coco! The coconut has fallen to the beautiful stones near the sandy beach in Nabas, Aklan. Shot was taken beside the scenic beach in Barangay Buenasuerte, same site of my WW entry last week. It caught my attention because the coconut seems to be all alone and the center of attraction here. See my son Josh having some fun with water splashing on him in my entry at Moments of My Life! More WW entries -> here. That is a huge coco!!! 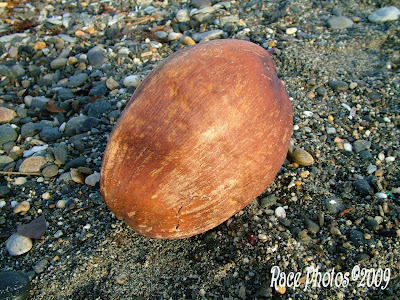 Happy Wordless Wednesday..
A mature and lonely coconut. Great shot! I have posted the awards here. Thanks ulit! Seeing and even thinking about coconuts on a beach brings back some very goodly memories! Thanks kindly for sharing this!